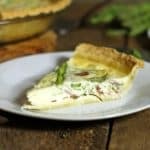 If you’re looking for a light, yet flavor packed breakfast or lunch idea, but need a recipe that’s quick to make, this prosciutto and asparagus egg white quiche is the perfect fit. By leaving out the fat and calorie heavy cheese, whole eggs, and cream that many vegetable quiches call for, this healthy spring meal can be eaten any time of day, guilt free! Chalk full of fresh asparagus, you can even bake this egg white quiche in a pan without a crust to make it even healthier, and gluten free! All quiches are essentially a custard thickened with egg which is then baked in a crust with various ingredients to flavor it. The custard filling traditionally uses a rough 2:1 ratio to ensure the right quiche texture. This ensures there is enough egg to set the custard without the quiche becoming scrambled egg. Whole eggs are usually used because the yolks add richness and flavor to the finished product. They aren’t really necessary though, as the real binding power lies in the egg whites. To make a lighter, and healthier quiche using only egg whites, we have to tweak the above ratio a little. Instead of 1 whole egg per 1/2 cup of dairy well use 2 egg whites per 1/2 cup of dairy. To make this quiche as quickly and hassle free as possible you need to plan ahead. This goes for most recipes though, with a little planning all food becomes easier to prepare. You can use a store bought pie crust, but I prefer making my own, as it only contains 4 ingredients, and doesn’t contain preservatives. Make it the night before (it only takes 5 minutes!) to let it set in the fridge overnight. You can even completely forego the crust and make a ‘crust-less quiche’ by simply pouring the ingredients and egg mixture into the quiche mold itself. Asparagus is only in season a few short weeks of the year, so why not take advantage of it! You don’t even need a whole lot of it for this egg white quiche, 6 or 7 spears cut into ribbons will do. Of course feel free to load it up with more if you prefer! Use a vegetable peeler to cut the asparagus into ribbons for a delicate and professional looking asparagus quiche! The prosciutto provides a natural salty rich flavor in contrast to the light asparagus. Regular bacon or pancetta can be substituted but will be much higher in fat. Start by pre heating your oven to 425F. As the oven, pre-heats roll out your pie dough, and lightly grease your pie pan or quiche mold with butter or oil. Line the pie pan with the dough making sure to press it firmly into the corners. 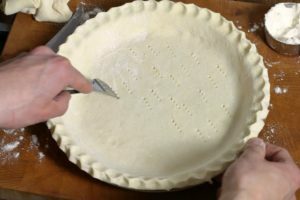 Dock the pie crust with a fork,(this prevents it from bubbling up while blind baking), and then place it in your hot oven to blind bake for 10 minutes. While blind baking quiche is a topic that’s debatable for some, I feel that it provides a more thoroughly cooked crust. As the crust is blind baking, quickly dice the prosciutto, and saute it in a pan. You don’t need to cook it till it’s crispy, just to slightly cook it. 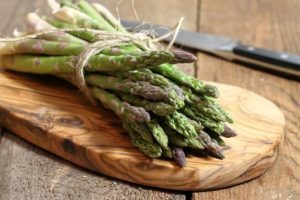 While it’s cooking, trim the woody end of the asparagus, and then using your vegetable peeler, shave the asparagus stems into thin slivers. 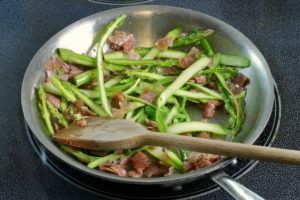 Mix the asparagus and prosciutto together, and lightly season it with some cracked black pepper. By now the quiche shell should be just about done baking, or have already come out of the oven. Add the filling to the partially baked crust. Set the partially baked quiche aside. Take a mixing bowl and quickly whisk together the egg whites and milk. Pour this mixture into the quiche shell and then place the filled egg white quiche back in the oven. Immediately drop the oven temperature to 325F. Bake the asparagus quiche for 30 to 40 minutes until the egg mixture is fully set and does not jiggle when shaken. Either serve the asparagus quiche immediately while hot, or fully cool then cut the quiche. The individual cold portions can be baked in a hot oven or heated in a microwave to re-heat. 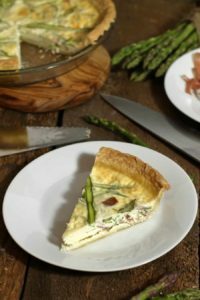 A light and healthy yet flavorful egg white quiche, loaded with prosciutto and asparagus. Perfect for spring! 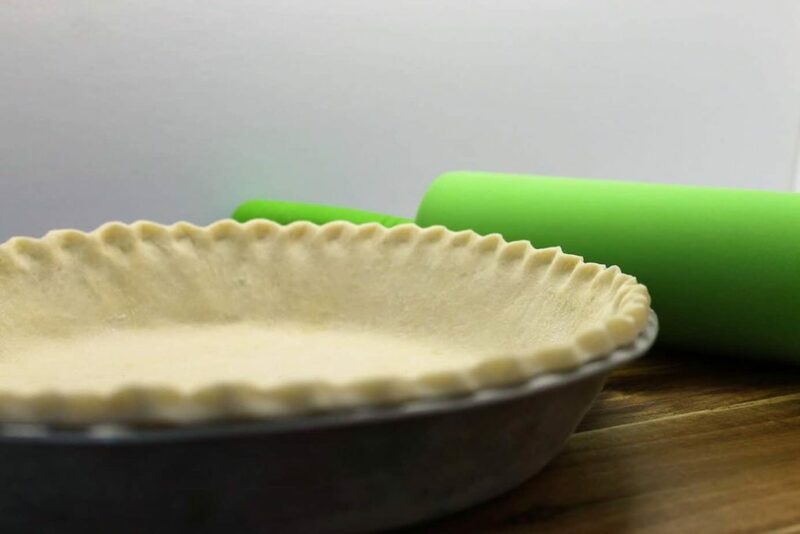 As the oven pre-heats, roll out your pie dough, and lightly grease your pie pan or quiche mold with butter or oil. Line the pie pan with the dough making sure to press it firmly into the corners. Dock the pie crust with a fork. Blind bake the quiche shell for 10 minutes. After taking out the partially cooked crust, turn the oven down to 325F. As the crust is blind baking, dice the prosciutto, and lightly saute it in a pan. 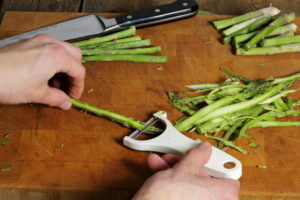 While the prosciutto is cooking, trim the woody end of the asparagus, and then using your vegetable peeler, shave the asparagus stems into thin slivers. Add the asparagus/ prosciutto filling to the partially baked quiche crust. Take a mixing bowl and quickly whisk together the egg whites and milk. Pour this mixture into the quiche shell and then place the filled egg white quiche back in the oven. Bake the quiche for 30 to 40 minutes until the egg mixture is fully set and does not jiggle when shaken. Either serve the egg white quiche immediately while hot, or fully cool then cut the quiche. The individual cold portions can be baked in a hot oven or heated in a microwave to re-heat. You can completely forego the pie crust and make a crust-less egg white quiche by simple baking the egg mixture and filling together in greased pie pan. This quiche looks so delicious, and I love that you ribboned the asparagus. I’ve never done that but must try sometime. Great recipe! What a beautiful, springtime quiche! I love that you can assemble it the night before and pull it out of the fridge ready to bake in the morning! 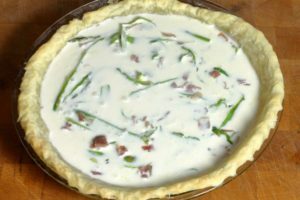 The perfect Springtime quiche! I LOVE quiche and I love that you’ve included the ‘perfect dairy to egg ratio’ – so helpful! This would be wonderful for a brunch! It would make a great brunch item! The ratio can be used to make any kind of quiche! You can even, switch up the dairy and use cream for a very rich and silky texture or lactose free milk if you are lactose intolerant. Those flavours are taking me back to spring in Italy! And with the asparagus farm just down the road from me opening yesterday, this quiche is the perfect choice for me today–crustless to keep it gluten-free! Thanks for all the recipe tips! You’re welcome! I’ve never been to an asparagus farm! Now I want to try and grow it myself!